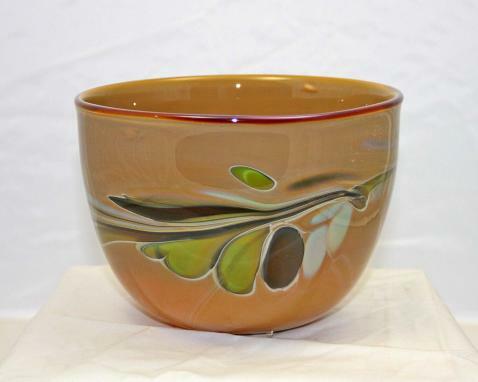 This bowl is an example of my intentional work of "Giving and Receiving". When our lives are full, we give. When we feel emptiness and despair we need to receive. "Everytime you use or view this bowl, remember to Give Unconditionally, and Receive with Grace." Your Intention, aligned with my intuitive and Law of Attraction skills. Your metaphysical/spiritual or healing intention will be received and imprinted into the glass. This process will require a personal contact with you to clearly understand your desire. Preferably we will talk on the phone for a couple of minutes. I will ask you for your intent, and maybe a little about the direction (who it is for, relationship, etc. ), reason (wedding, anniversary, etc.) and physical form (what shape) of the gift. My notes will be with me at the bench when I blow the piece of glass. Before I start to create a piece of glass art, I sit quietly and ask my inner heart/soul to assist me in the process. I give thanks for the opportunity to add beauty to match your intention and the recipient of your gift. I ask for the skill and patience needed to produce this individualized piece. Finally, I ask the Universal Source to align with the harmonious vibrations, with this requested intention in the now, and all similar expressions from the past and the future. If you are seeking a gift with a spiritual meaning or intent, then together we can cocreate the unique and lasting gift you are looking for. This gift will serve as a beautiful piece of art and energetically emit the vibrational intent within the piece. You may contact me via email to set up a time to personally receive your Intention(s). I am honored to be able to provide this service to you and your recipient. I believe this to be such a unique opportunity to serve you and others in the metaphysical and spiritually awakened community. Thank you.